Potentiometers find wide application in electric circuits. Potentiometers are used for controlling voltage or current in an electric circuit. A common example for the potentiometer is the volume control knob in the radio set. The rather strange name for the potentiometer is due to its history. In the early years of electrical technology, the potentiometer was used in circuits designed to measure voltage. A potentiometer consists of a coil of a wire that is wound over a circular or linear support. A metallic contact known as the wiper moves over the coil. The wiper is usually made of graphite. The potentiometer has three terminals. The wiper is usually the central terminal. The other two terminals belong to the coil. 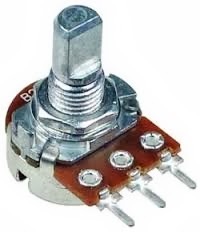 Preset Potentiometers are very small potentiometers which are enclosed in the equipment. These potentiometers have a small groove to be adjusted with a screwdriver. These Potentiometers are to be adjusted only on rare occasions when the equipment is to be calibrated. While the potentiometer has three terminals, in many applications only two terminals are used. In such an application, the potentiometer is used as a rheostat. When all the three terminals of the potentiometer are and the potentiometer behaves like a Voltage divider. The linear potentiometer and the logarithmic potentiometer are types of Specialised potentiometers.